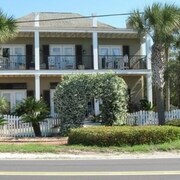 Paradise30a ~ Summersalt, Community Pool, Balcony Ocean Views, Sleeps 4, Dog Friendly! 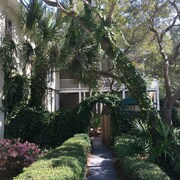 Paradise30a~my Happy Place, Seagrove Beach, Close to Beach, 2 Community Pools! Travel is the best thing your money can buy, but you don't have to drop a bundle to do it. 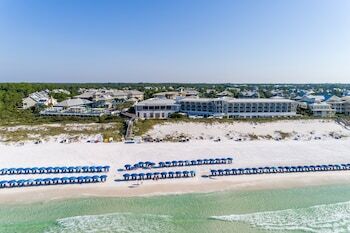 If you've always wanted to see Santa Rosa Beach, read on for inspiration! Where is Santa Rosa Beach? This destination is around 110 miles west of Florida's capital, Tallahassee. Santa Rosa Beach is also 11 miles east of Miramar Beach. 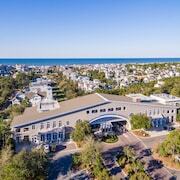 The Newbill Collection by the Sea and the Fusion Art Glass Gallery are all close at hand and renowned for coordinating free or reasonably priced arts and cultural events. Look over the programs to see if anything takes your fancy. Tired of indoor attractions? Need to get out into the fresh air? Stop by your choice of Eden Gardens State Park and 30A Bike Trail for some reinvigorating exercise and stunning views. CheapTickets is not your average low-cost travel brand. We're devoted to fulfilling your money-saving vacation dreams. What's more, we'll never compromise on the quality of your flights, hotels or experiences. Just because you're a thrifty traveler doesn't mean you'll have limited options. Book your trip with us and choose from 500 airline partners and 500,000 properties globally. Want to know the best part? 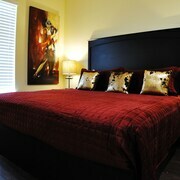 If you combine your bookings, you can save up to $481. How's this for putting you at ease? If you discover your package for a cheaper rate within 48 hours of booking it, we'll match the price and refund the difference. That's what we call our Price Guarantee. How's this for a bonus? Our simple rewards program not only saves you dollars on your next qualifying CheapTickets hotel booking, it also works together with our other promotions. All you've got to do is book that flight! You're just a couple of clicks away from reaping the rewards. You'll save on all eligible bookings, not to mention extra thrifty perks and bonus offers that are sure to put a smile on your dial. Simply sign up for free or log in, join CheapCash and you're good to go! We get the drift — you've already spent enough of your precious savings on your big adventure, so the last thing you want to be doing is stumping up for cabs. 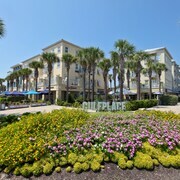 Fortunately, Santa Rosa Beach has some good car rental outlets which should ease the burden on your wallet. When you land at Northwest Florida Regional Airport, you'll be pleased to know you can book right at the terminal. It's almost impossible to miss Budget and Enterprise. You might also like to check out Dollar Rent A Car and Avis. CheapTickets can help you lock in an affordable room in this destination, but you ought to reserve one quickly! 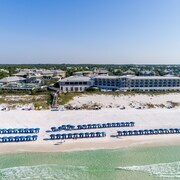 At present, there are just 15 hotels in Santa Rosa Beach. Don't want to spend hours researching hotels? Let us make life a little easier! 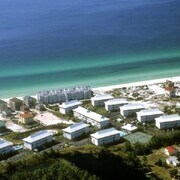 Our recommended hotels here include the WaterColor Vacation Rentals and WaterColor Inn & Resort.